Body Shaper Market Segmented By Company Profiles ; Spanx Inc, Jockey International, Inc, Belly Bandit, Wacoal, Nike Inc, Under Armour Inc, PUMA, Ann Chery, Annette International Corporation, Corset Story UK, Fájate Diseño de Prada, Hanesbrands Inc, Leonisa, Spiegel LLC, Marks & Spencer plc, Tolbert Yilmaz Manufacturing, Inc, Rago Shapewear, Calzificio Pinelli Srl, Body Hush, Lytess, Others. This report provides forecast and analysis of the global body shaper market. It provides an analysis on the basis of historical data and forecast from 2018 to 2027 in terms of revenue (US$ Mn). The report reveals market dynamics in seven geographic segments along with market analysis for the current and future scenario. In addition, it includes drivers, restraints and recent trends of the body shaper market. The report also comprises opportunities for the manufacturers of body shapers and highlights the value chain analysis in detail. The study demonstrates the market dynamics and trends across regions that are expected to influence the current status as well as the future prospects of the body shaper market. The report studies the global body shaper market for the period 2018–2027. The prime objective of this report is to offer quantitative and qualitative insights and study key market trends pertaining to the global body shaper market that gradually help transform businesses. The market numbers have been assessed by carefully scrutinising the body shaper spending of countries in all the six key regions for the current year, as well as the historical performance of the market. Market size and forecast for each segment of the body shaper market has been provided in the context of regional markets. All the segmentation for body shaper market has been considered after appropriate secondary research and revalidation of the data obtained through interviews with key thought leaders and industry experts. The market has been forecast based on constant currency rates. The report includes the revenue generated from sales of body shapers across all regional economies. The report begins with an executive summary intended to provide a clear perspective about the market to the reader. It is then followed by an overview of the body shaper market and provides the market definition and analysis about drivers, restraints, opportunities and key trends in the body shaper market. The sections that follow include an analysis of the global body shaper market by product type, price range, demographics, sales channel and country-level analysis. On the basis of product type, the global body shaper market is segmented tops, bottoms, waist shapers and shaping bodysuits. The global body shaper market is further segmented on the basis of control type. The control type segment includes firm control, light control, medium control and tummy control. The global body shaper market is also segmented by material type, which includes cotton, polyester, nylon and mix. The body shaper market is further segmented on the basis of sales channel, which includes hypermarkets/supermarkets, specialty stores, multi-brand stores, company website and 3rd party online sales. All the above sections evaluate the market on the basis of various factors affecting the market, which cover the present scenario and future prospects. For market data analysis, the report considers 2017 as the base year, with market numbers estimated for 2018 and forecast made for 2018–2027. All the segmentation of the body shaper market have been considered after appropriate secondary research and revalidation of the data obtained through interviews with key thought leaders in the industry. The market has been forecast based on constant currency rates. The next section of the report highlights the market by region and provides the market outlook for 2018–2027. The study investigates the regional Year-On-Year (Y-o-Y) growth of the body shaper market. Key regions assessed in this report include North America, Latin America, Europe, Asia Pacific Excluding Japan, Middle East & Africa and Japan. The report evaluates the present scenario and growth prospects of the regional market for 2018–2027. The body shaper market numbers have been assessed based on sales and weighted average pricing by product type. The aggregate revenue is derived through weighted average country pricing trends. A country-level assessment of each segment of the body shaper market in terms of size and forecast has been provided. The body shaper market has been analysed based on expected demand and current spending scenario. Pricing is considered for the calculation of revenue and the average country prices are obtained through primary quotes from numerous regional body shaper manufacturers, suppliers and distributors. All key product types have been considered on the basis of secondary sources and feedback from primary respondents. Country-wise demand patterns have been considered while estimating the consumption of body shapers across various regions. The body shaper market numbers for all the regions by product type, price range, demography and sales channel have been derived using the bottom-up approach, which is the sum total of the demand from each country. The company-level body shaper market share has been derived on the basis of revenues reported by key manufacturers. The body shaper market has been forecast based on constant currency rates. Given the characteristics of the market, we have triangulated the outcome on the basis of three different types of analysis: based on supply side, demand side and the impact of macro-economic factors on the body shaper market. In addition, it is imperative to note that, in a fluctuating global economy, we not only conduct market forecasts in terms of Compound Annual Growth Rate (CAGR), but also analyse the market based on key parameters, such as Y-o-Y growth rates, to understand the predictability of the body shaper market and identify the right opportunities for players. 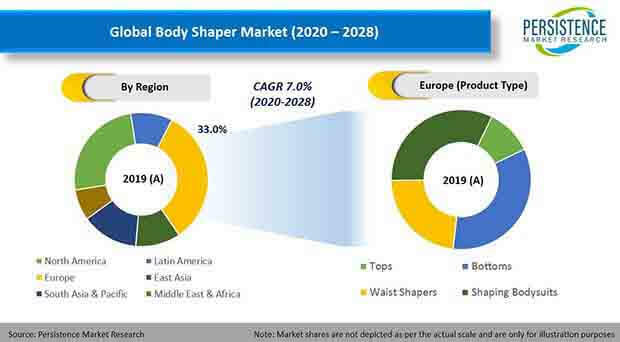 The market segments for the global body shaper market have been analysed in terms of Basis Point Share (BPS) to understand the relative contributions of each segment to market growth. This detailed level of information is important for identifying the various key trends in the body shaper market. Another key feature of this report is the analysis of the market in terms of absolute dollar opportunity represented by the sales of body shapers. Absolute dollar opportunity is critical for evaluating the scope of opportunity that a provider can look to achieve as well as to identify lucrative segments. The overall absolute dollar opportunity represented by the body shaper market is mentioned in the report. To understand key growth segments in terms of the growth and adoption of body shapers in global market, FMI has developed the market ‘Attractiveness Index.’ The resulting index is expected to help providers identify real market opportunities. A number of primary and secondary sources were referred during the course of the study. Some of the secondary sources include IMF, World Bank, Hoovers, Factiva, annual reports of companies and government associations & publications. In the final section of the report on the body shaper market, a ‘dashboard view’ of the companies is provided to compare the current industrial scenario and their contribution in the global body shaper market. Moreover, it is primarily designed to provide clients an objective and detailed comparative assessment of key providers specific to a segment in the body shaper market. Report audiences can gain segment-specific manufacturer insights to identify and evaluate the key competitors in the body shaper market. Detailed profiles of companies are also included in the report to evaluate their strategies, key product offerings and recent developments. The key players of the global body shaper market include Spanx Inc., Jockey International, Inc., Belly Bandit, Wacoal, Nike Inc., Under Armour Inc., PUMA NA, Ann Chery, Annette International Corporation, Corset Story UK, Fájate Diseño de Prada , Hanesbrands Inc., Leonisa, Spiegel LLC, Marks & Spencer plc, Tolbert Yilmaz Manufacturing, Inc. (EuroSkins), Rago Shapewear, Calzificio Pinelli Srl. (SOLIDEA), Body Hush and Lytess. Apparel is one of the oldest and most dynamic products. Most of the countries manufactures textile and apparel for the global market. Thus, over the past few years, the geographical distribution of production in the apparel and textile industries has changed dramatically. More than 60% of the global clothing that is exported is manufactured in developing countries. Body shapers include garments or undergarments that help hold the fat in the body together and make a person appear slimmer. The fabric of body shapers is strong, thick and elastic in nature. An increasing percentage of population is getting influenced to maintain a healthy & fit lifestyle. Moreover, growth in the number of fitness enthusiasts is also expected to support the growth of the body shaper market during the forecast period. Consumers are demanding branded body shaper products as they are getting influenced by commercial advertisements, entertainment channels and movies, due to which branded products are considered as higher quality products. Companies are also focusing on adopting various marketing strategies, such as celebrity endorsements, new product launches, marketing campaigns, events and the expansion of their digital presence to connect with customers directly. In addition, companies are also launching products that are inspired by celebrities. These factors are likely to accelerate the growth of the global body shaper market in the near future. For instance, in 2017 Spanx, Inc. launched a collection of shapewear (body shapers) for brides. The company introduced products in different sizes to target each segment. The collection ranged from sizes XS-2X. In addition, in 2013, Spanx, Inc. expanded its product portfolio by launching various product ranges, which include shapewear, hosiery, foundations and other slimming apparel under the brand name of Star Power. The rising adoption of the Internet and an increase in the global penetration of e-commerce are expected to fuel the revenue growth of the body shaper market. Consumers are getting more inclined towards convenience shopping, which has raised number of customers using digital technology for mobile transactions and the purchasing of various products online, which include consumer goods, electronic devices and others. Furthermore, as millennials are tech-savvy, companies are engaging with their consumers through social media and other digital avenues to advertise their body shaper products and increase their market share via online sales revenue. This is among the major factors accelerating the growth of the body shaper market during the forecast period. According to Assocham India, the India e-commerce market was valued at US$ 23 Bn in 2015 and is expected to increase further in the near future owing to rising Internet & mobile penetration, increasing online transactions among customers and favourable demographic factors in the country. By product type, the global body shaper market is segmented into tops, bottoms, waist shapers and shaping body suits. Among all these product type segments, the waist shapers segment is estimated to account for the highest value share in the global body shaper market and it is expected to remain dominant during the forecast period. The waist shapers segment is estimated to account for a 31.4% revenue share of the product type segment by the end of 2018, and is expected to gain 152 BPS in its market share by 2027 over 2018. In the global body shaper market, the waist shaper segment is expected to be closely followed by the tops segment in terms of growth. The tops segment is estimated to account for 11.3% value share in 2018. In the global body shaper market, the tops segment is expected to register a CAGR of 7.4% during the forecast period. To target mass consumers, manufacturers are continuously introducing body shapers with new features and designs. This is expected to drive the body shaper market over the forecast period. For instance, recently in 2018 in Cameroon, a waist cincher was launched under the brand name of RI`NASH waist cincher belt. Various companies are employing aggressive marketing techniques to expanding the inflow of consumers into their retail stores as well as their market share globally. The global body shaper market is further segmented on the basis of control type, which includes firm control, light control, medium control and tummy control. Among all the control type segments, the medium control segment is expected account for the largest share in terms of value. The medium control segment is estimated to account for a value share of 41.8% in 2018, and is expected to register a CAGR of 7.4% during the forecast period. The global body shaper market is primarily considered as per the large number of regional and multinational companies. Detailed profiles of companies are also included in the global body shaper market report to evaluate their strategies, key product offerings and recent developments. Some of the key players profiled in the global body shaper market study include Spanx Inc., Jockey International, Inc., Belly Bandit, Wacoal, Nike Inc., Under Armour Inc., PUMA NA, Ann Chery, Annette International Corporation, Corset Story UK, Fájate Diseño de Prada, Hanesbrands Inc., Leonisa, Spiegel LLC, Marks & Spencer plc, Tolbert Yilmaz Manufacturing, Inc. (EuroSkins), Rago Shapewear, Calzificio Pinelli Srl. (SOLIDEA), Body Hush and Lytess.